Also: The car freaking rips. 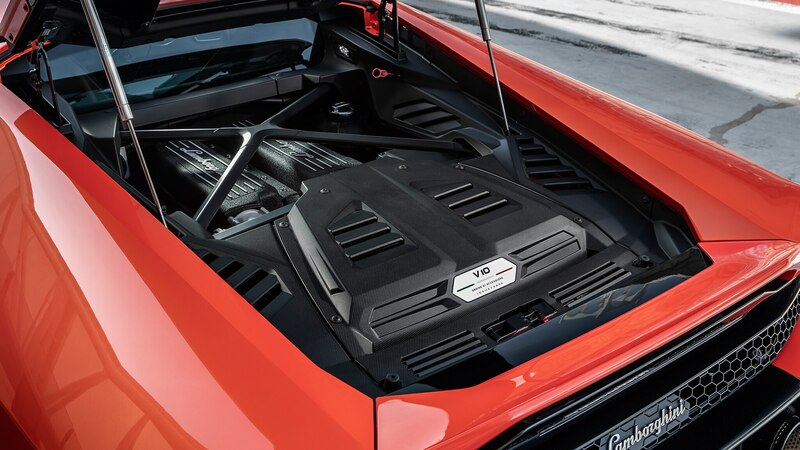 There’s no denying the snarl of the Lamborghini Huracán’s V-10, an unrepentantly vicious 5.2-liter powerhouse that, having first appeared in the 2003 Gallardo, remains a stirring artifact from the era of high-revving, naturally aspirated supercars. 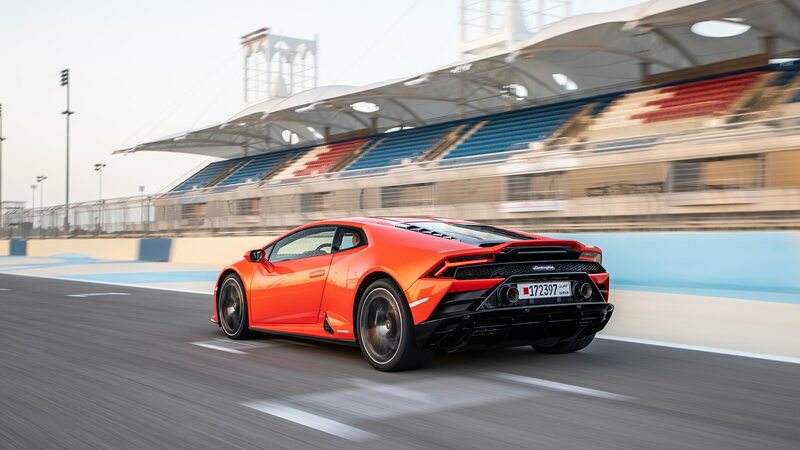 While it and the Huracán may seem anachronistically analog against the increasingly digitally enhanced competition from Woking and Maranello, the engine nevertheless muscled the Huracán Performante and its sophisticated active aerodynamics to the production-car lap record at the Nürburgring in 2017. 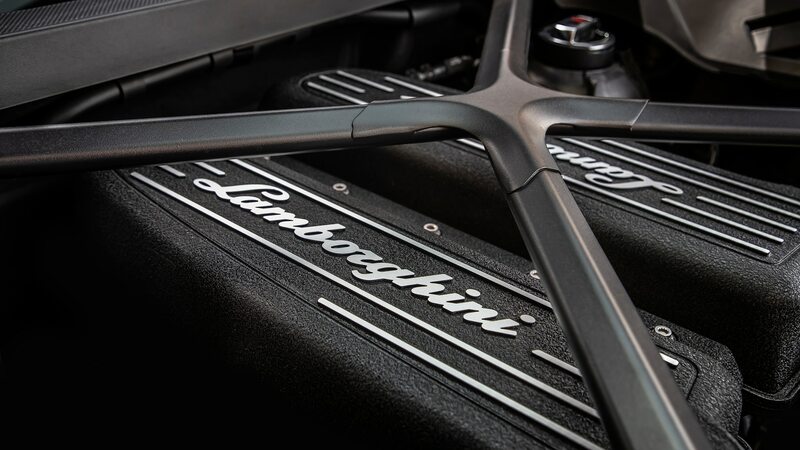 The record has since been topped twice—it’s currently held by Lambo’s own Aventador SVJ—but the point is this: The engine may be older, but it remains formidable. 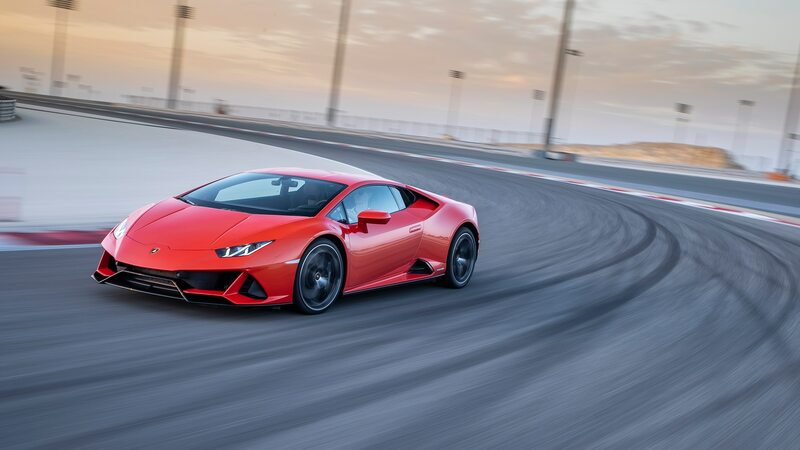 To wit, it returns again in the new Huracán Evo, which replaces the base Huracán as Lamborghini’s entry-level sports car. 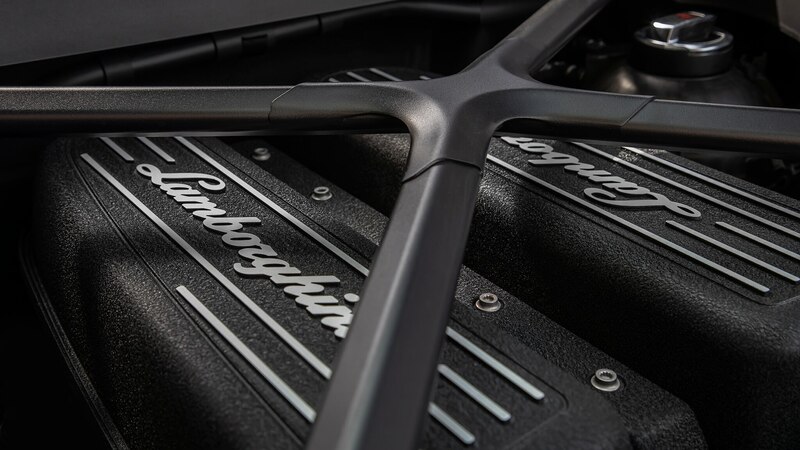 The Evo gets the Performante’s rowdy 631 horsepower and a flurry of new tech. 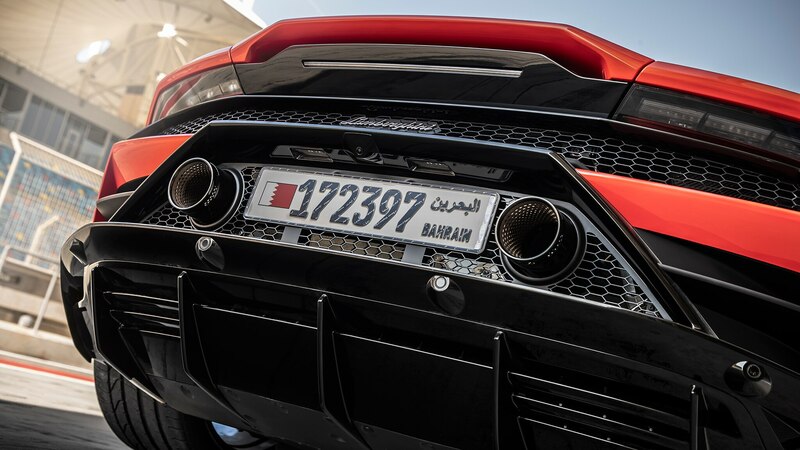 Though the Performante’s active aero isn’t available here, the Evo’s all-wheel-drive powertrain is masterminded by a new CPU Lamborghini dubs LDVI (for “Lamborghini Dinamica Veicolo Integrata”). 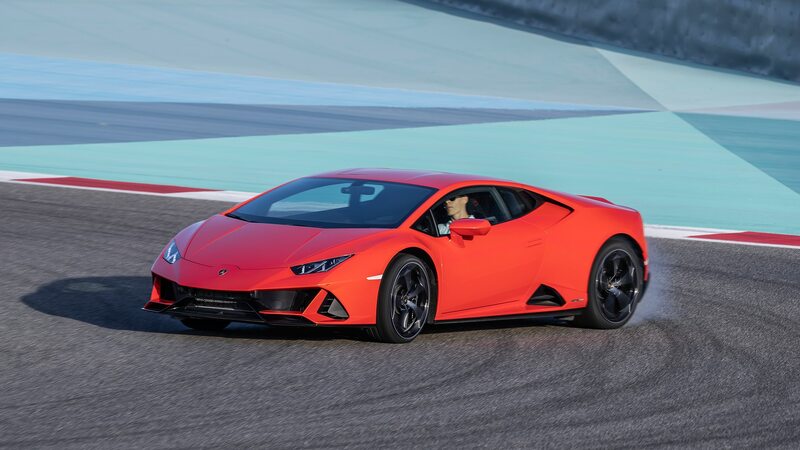 The electronics now manage a kaleidoscope of systems including a new four-wheel steering setup, updated traction control, and, in Lambo’s first use of the technology, a brake-based torque-vectoring function. 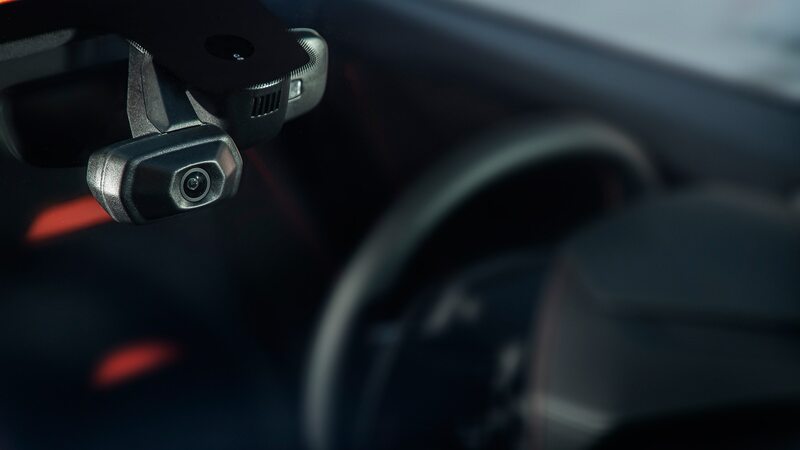 As before, drive modes are managed by a steering wheel-mounted toggle that switches between Strada (road), Sport, or Corsa (race) settings. 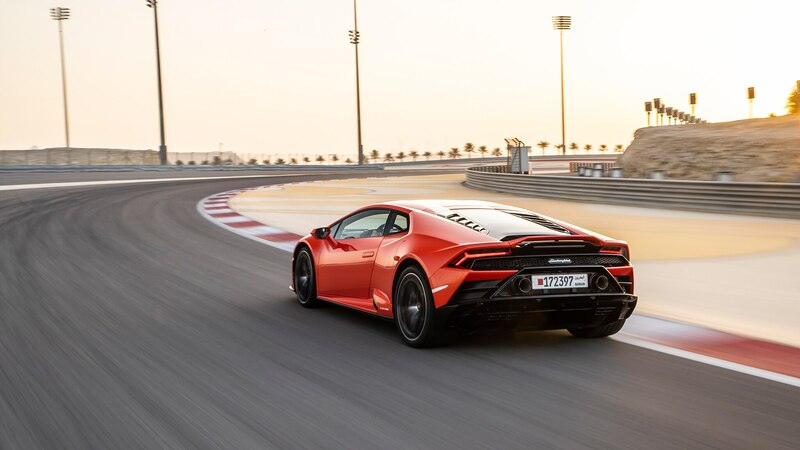 Lamborghini says the two-seater’s new brain now works predictively and not reactively, and the non-active aerodynamics have also been upgraded to alter the car’s personality by producing seven times more downforce than before and considerably greater force at the tail. 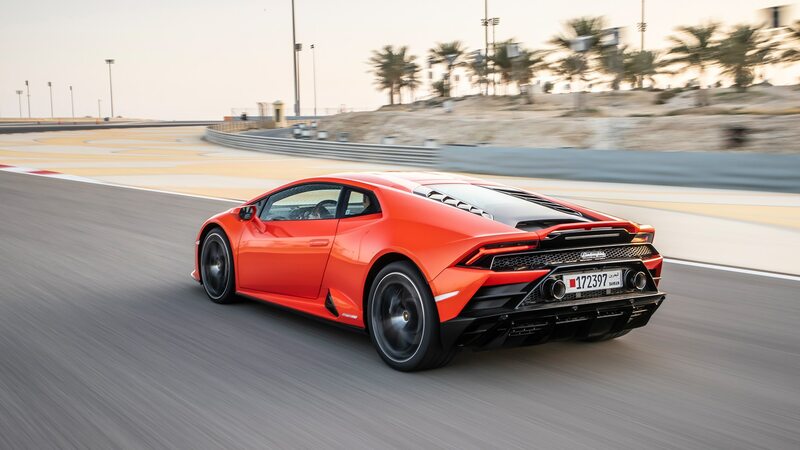 This all gives the Evo a somewhat different personality and makes it considerably stickier than its predecessor, albeit still not as glued down as the Performante. 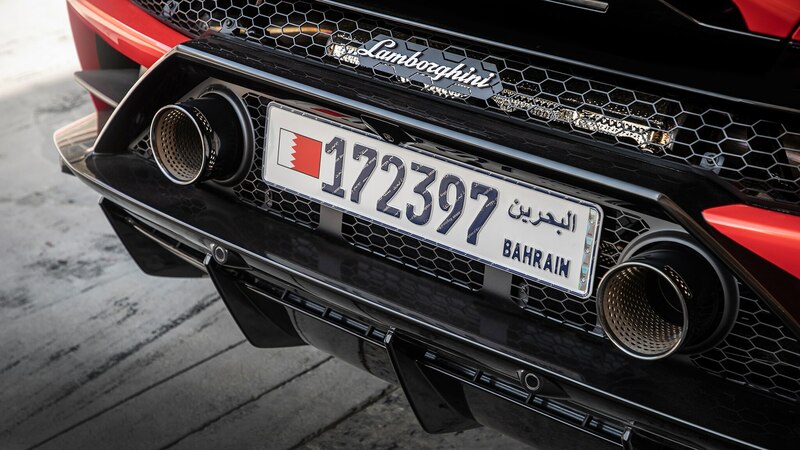 Also upgraded are the car’s magnetorheological dampers, which now have more adjustability and responsiveness to offer the system’s newly adaptive programming. 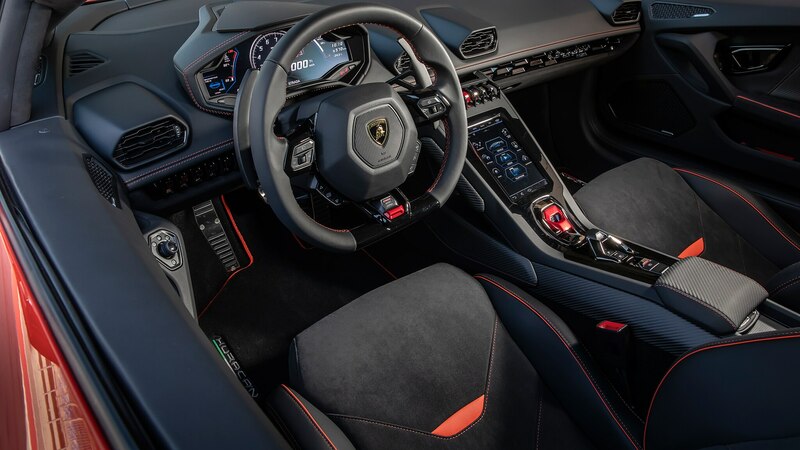 The updated cabin gets a vertically oriented 8.4-inch touchscreen between the front seats; it allows control of most vehicle functions via the Audi-derived interface familiar to anyone who’s been in a Urus. 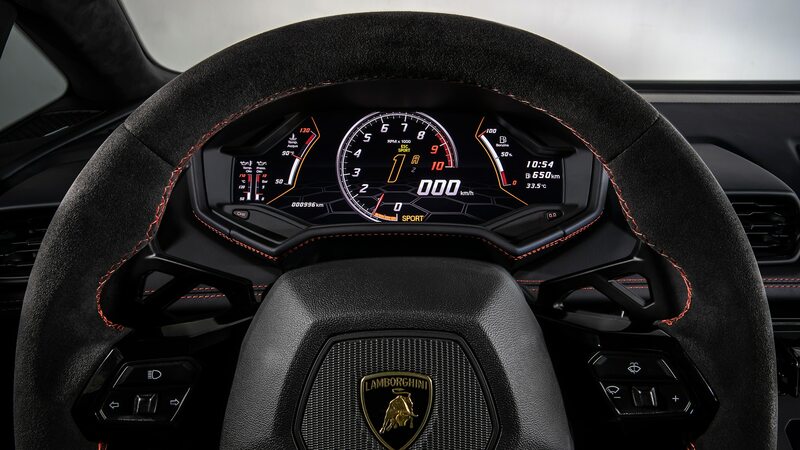 The setup introduces some much-needed modernity to the cabin, and gearheads in the passenger seat will appreciate the screen that monitors the vehicle’s dynamics, offering a gaming-style rendition of torque distribution, steering angle, and the like. 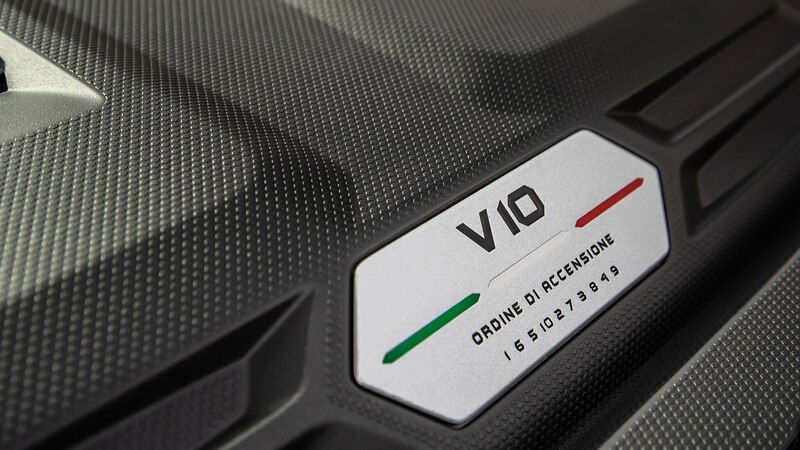 But don’t let the flashy graphics fool you: That venerable V-10 still lurks behind the cabin, ready to come to life with the press of the starter button and blast the atmosphere with combusted gases from the twin exhausts. As we have alluded to, it takes some acclimatization to explore the Evo’s full capabilities, especially when compared to the incredibly intuitive responses of the Performante. 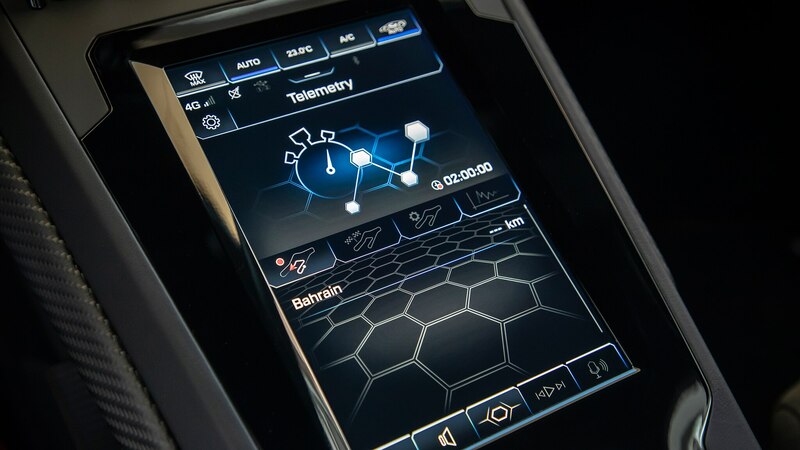 Between the new four-wheel steering, torque vectoring, and stability-control systems, there’s a learning curve for drivers who are tune into physical feedback and responses before wailing away at the track. 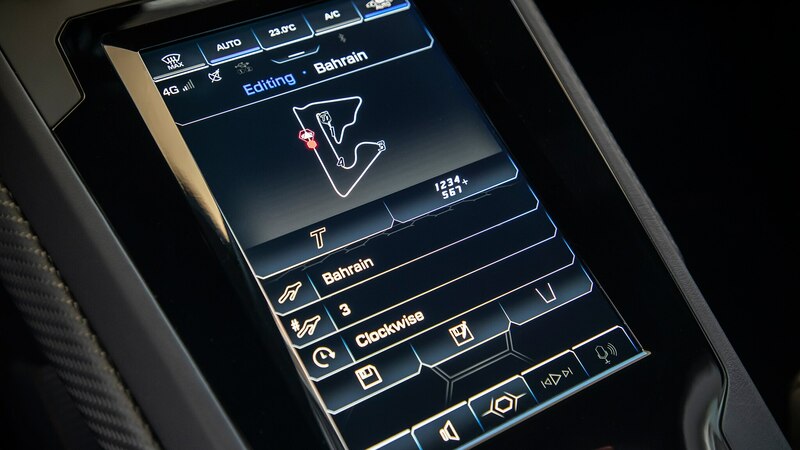 Also noteworthy is the variable-ratio steering, a mandatory feature that helps the computer keep the Evo on what it has determined to be the ideal racing line. 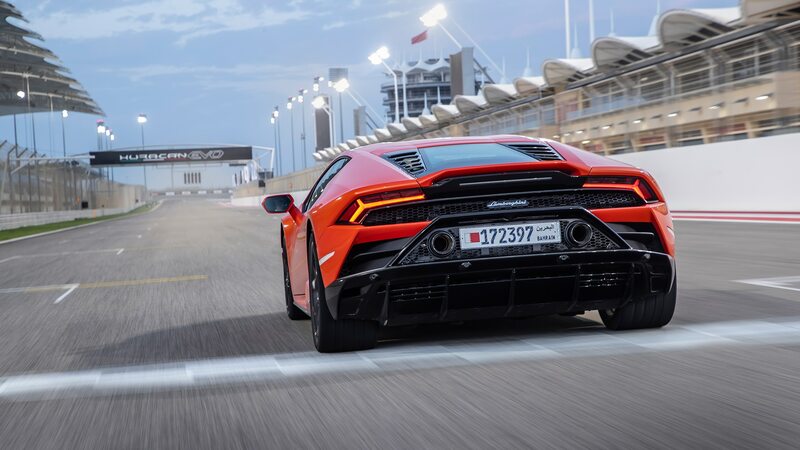 Because there’s so much wizardry going on with the drivetrain and dynamic-control systems, I was grateful to have a pro driver leading the way at Bahrain’s Formula 1 track, where I tossed the Lamborghini around the circuit’s 15 corners. 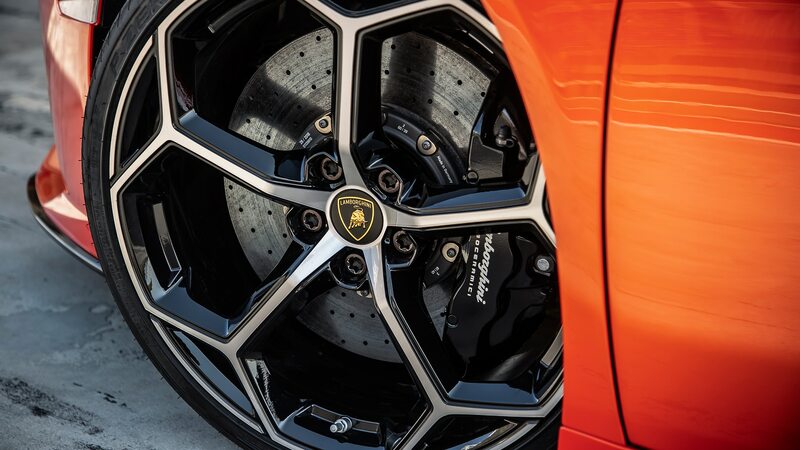 When the bespoke Pirelli P Zero Corsas start slipping for the first time through high-speed bends, questions like, “How quickly will it rotate?” and “Will this slide become a spin?” loomed large, especially since the variable-ratio steering sometimes left me second-guessing my inputs. 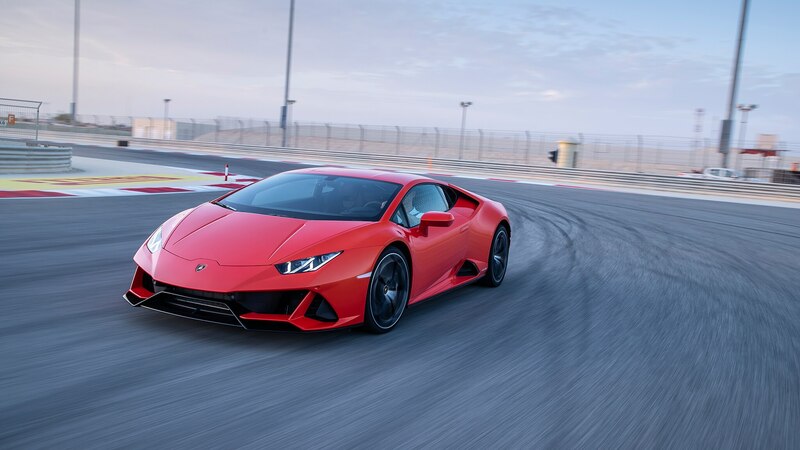 But once I found my pace during the second session, the high-speed bits revealed a surprising amount of controllability at the limit. 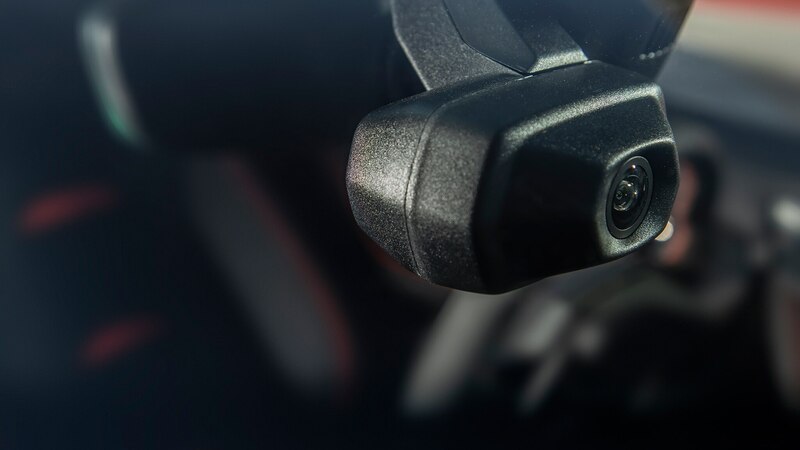 Corsa mode keeps you out of trouble by allowing just enough yaw angle to pull through corners with expedient efficiency. 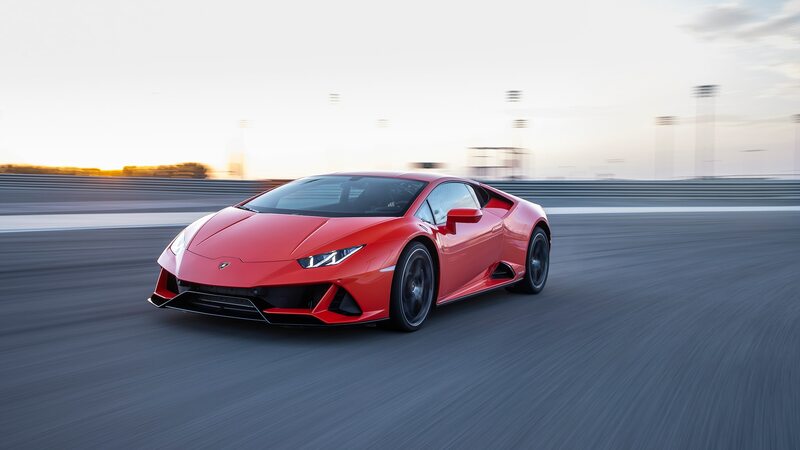 Sport is for a lewder sort of fun, where tail slides are controlled via an easily modulated throttle, and you get a feeling of near invincibility as the Evo slips sideways towards the apex. 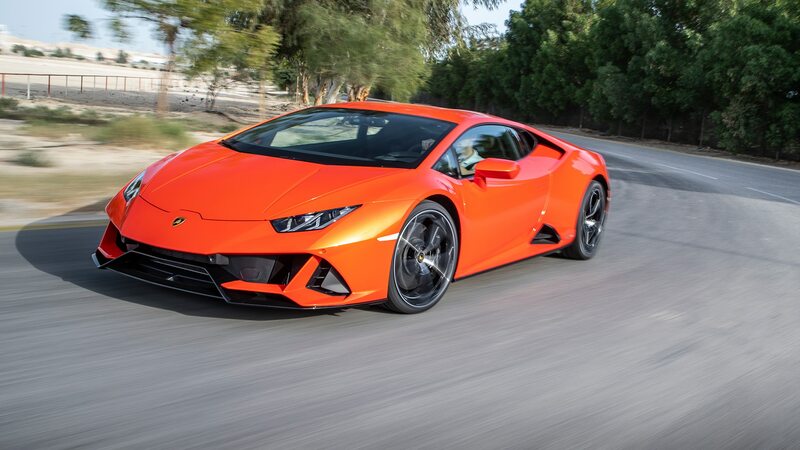 There’s no feeling of lash or other disagreements between the quick-shifting seven-speed dual-clutch and the all-wheel-drive system, and the large fixed paddles are easy to grab from almost any hand position. 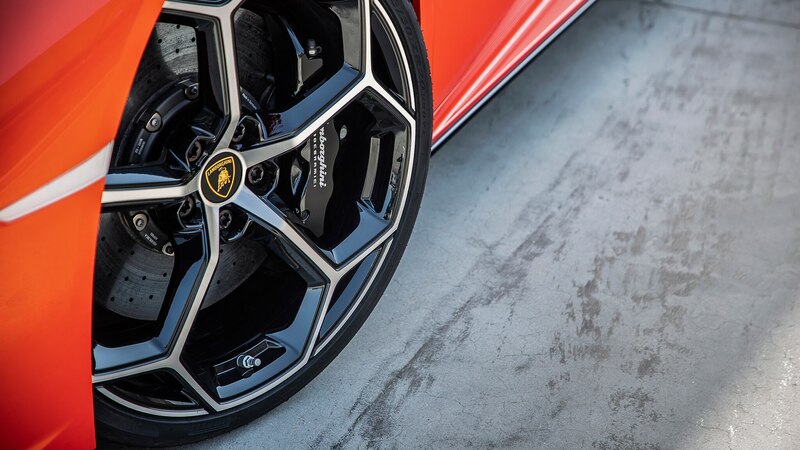 Standard carbon-ceramic brakes make swift work of slowing down the Lambo, though the pedal did soften up on the final lap of one of our sessions. 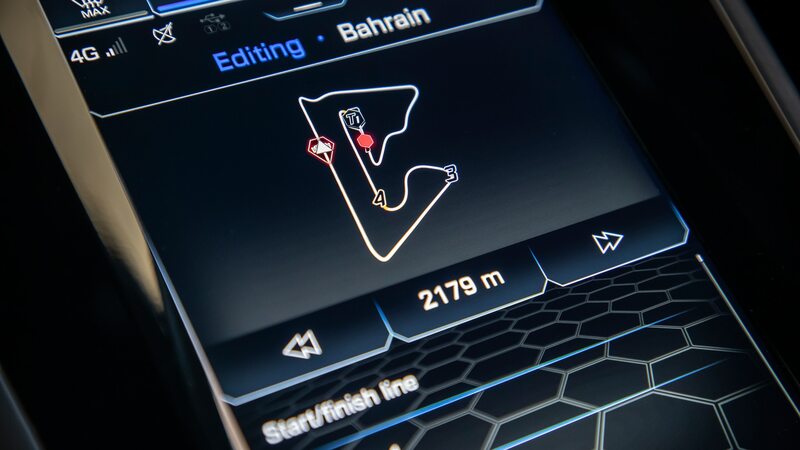 Your drive-mode selection is critical to the car’s dynamics, something I came to carefully consider before exiting the pit lane for lapping sessions. 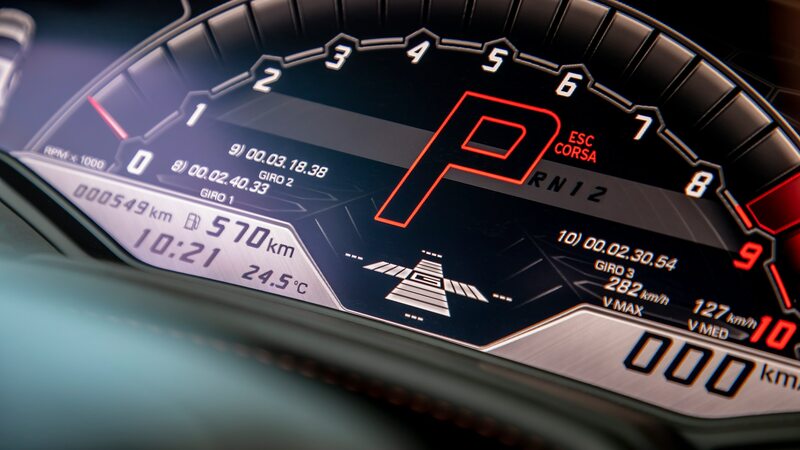 Each setting is more clearly defined than in the pre-evolved Huracán. 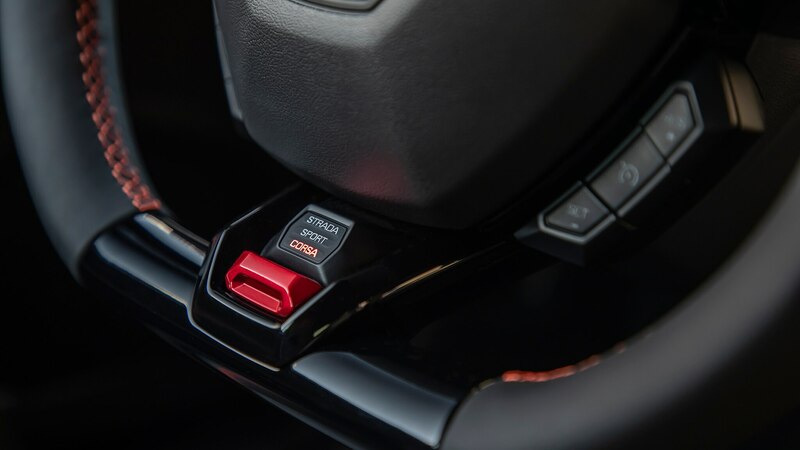 and in the Evo, Sport sees the car take on a more free-wheeling, slide-tastic tack, while Corsa is laser-focused on delivering the best lap times. 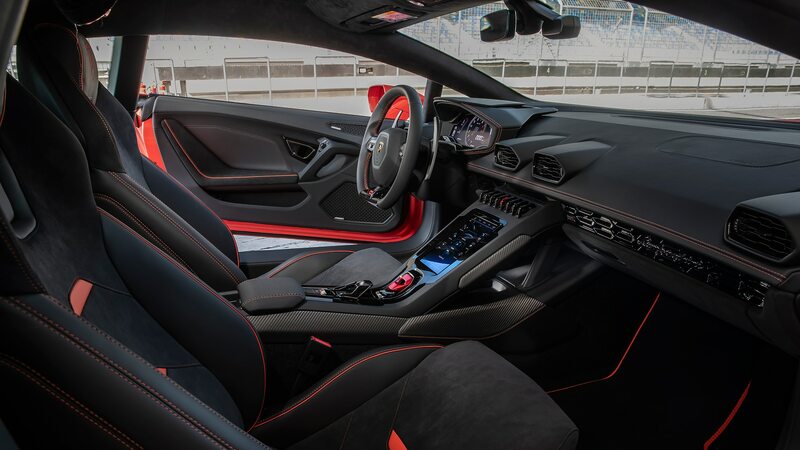 But one of the more paradoxical programming decisions persists in Corsa’s refusal to shift automatically at redline, which hampers its otherwise noble intention of getting around the track as fast as possible. 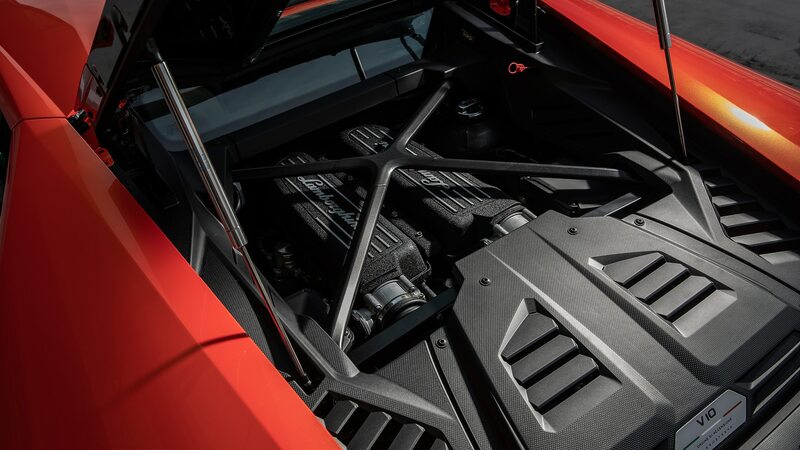 Without the option for automatic upshifts, the driver must perfectly time cog swaps via the big, fixed paddles—this is incredibly fun, but sometimes a challenge when the revvy V10 is screaming to its power peak at 8,000 rpm. Try shifting faster than the computer: I bet you can’t. 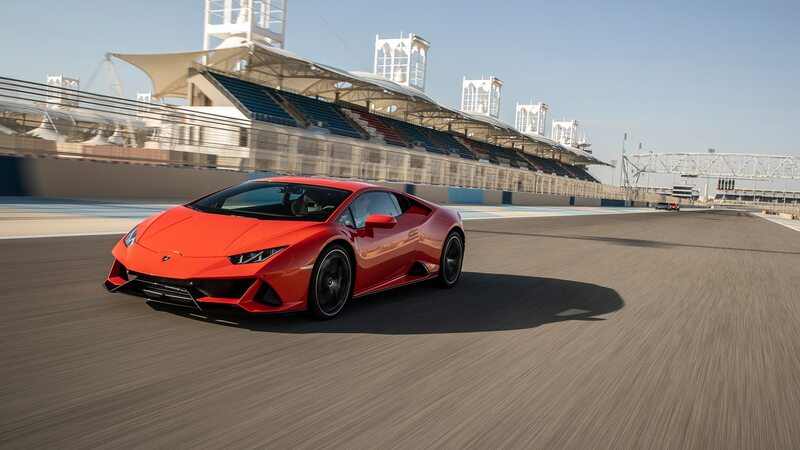 And if you’re foolhardy enough to choose Strada on the circuit, you’ll be hamstrung by a slower-shifting transmission and relatively soft suspension settings. 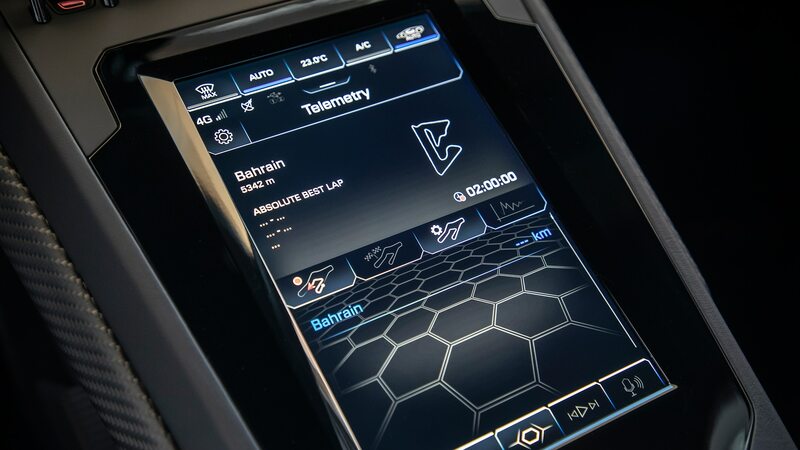 A post-drive debrief with Chief Technical Officer Maurizio Reggiani demystifies some of the electronic brain’s programming. 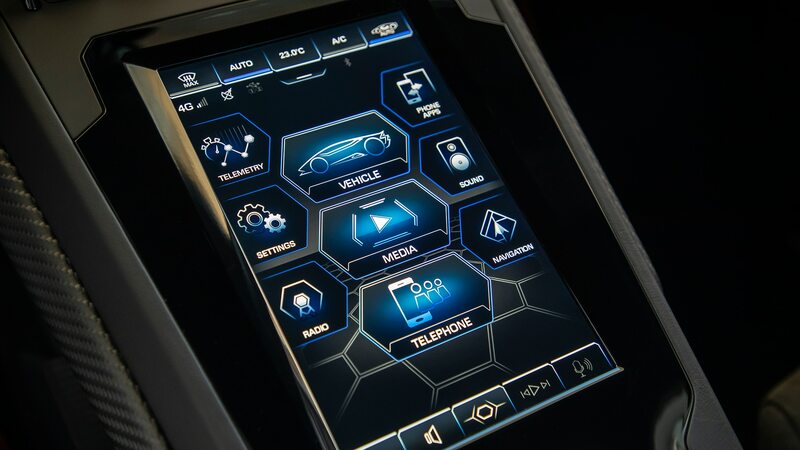 When pressed about the car’s eerie controllability while sideways, the Italian admits, “There are other companies doing what we do that call it ‘drift mode,’ but we don’t.” Reggiani disdains the idea of drifting for drifting’s sake, calling it “too much like a video game.” However, the Evo now possesses a certain exploitable playfulness that expands its repertoire considerably over its already immensely capable predecessor, and at the same time it brings newfound finesse to the Huracán’s saucier side. 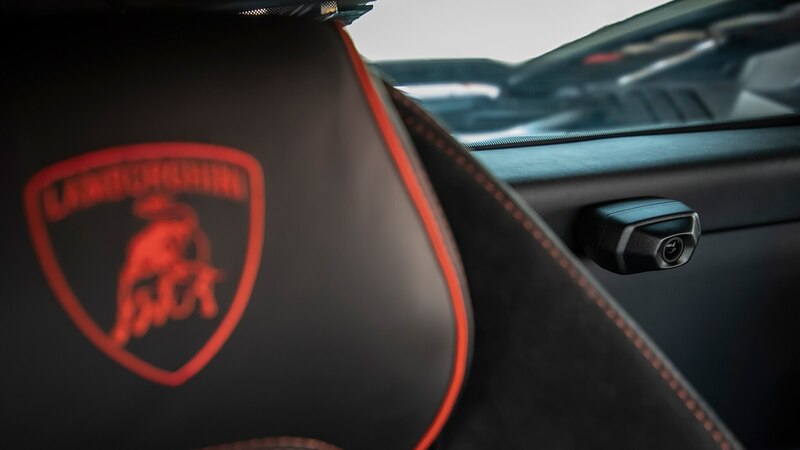 Overcome your initial fear of crossing the Evo’s limits, and you’ll experience a smoother, more defined limit and a depth to its controllability that wasn’t there before. 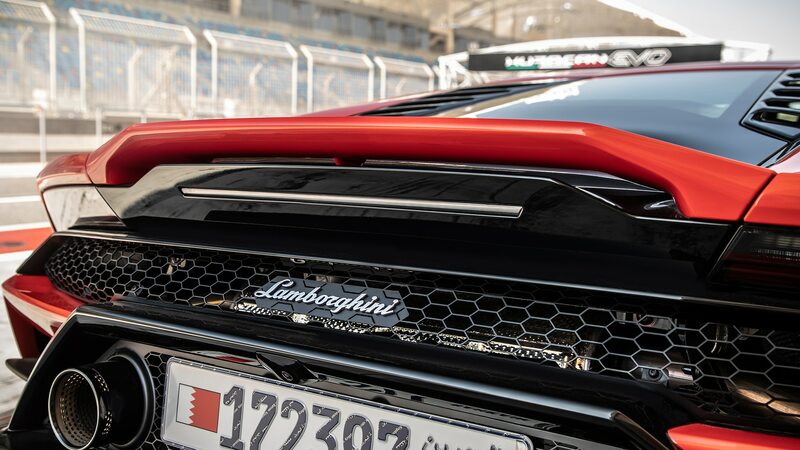 And while the new model can’t beat the Performante’s high-speed stability in corners, the Evo actually scores better laps times around smaller circuits like Nardo’s road course. 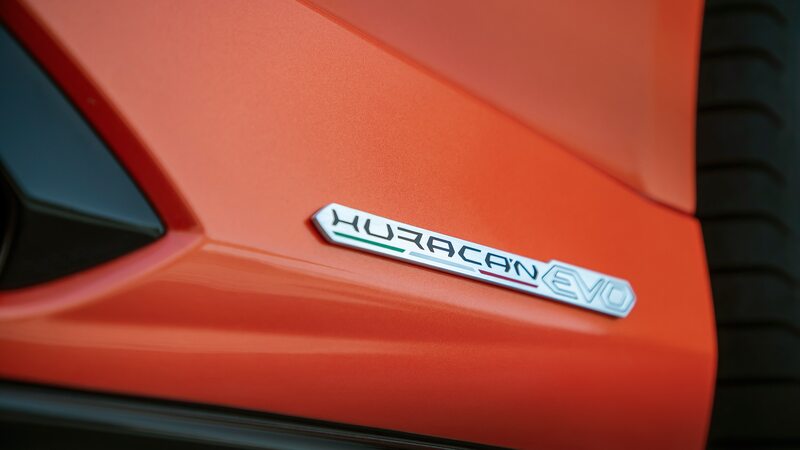 The Evo is aptly named, although what makes the evolution significant isn’t organic. 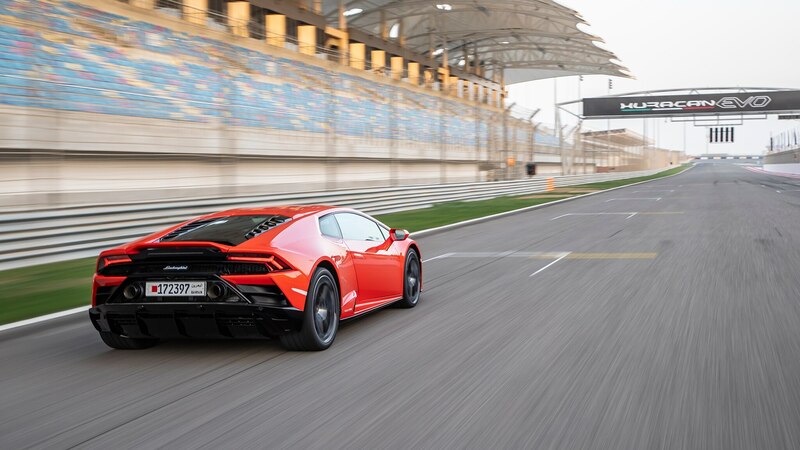 Indeed, it’s this Huracán’s more advanced digital programming and chassis technology that sees the Sant’Agata Bolognese brand push forward even while continuing to embrace that deliciously analog V-10. For those familiar with the Huracán, the Evo’s dynamics require some getting used to at track velocities, but the experience is likely more straightforward on public roads, where the car’s upper limits will rarely be reached. 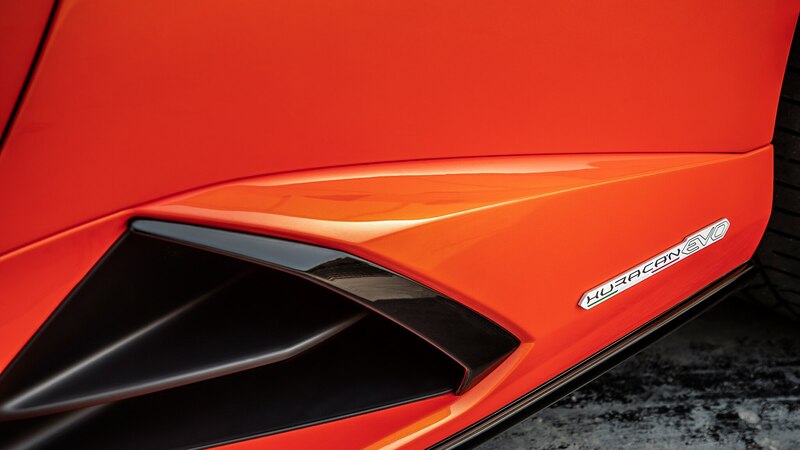 The Evo may not be an entirely seamless step forward—progress rarely happens that way. 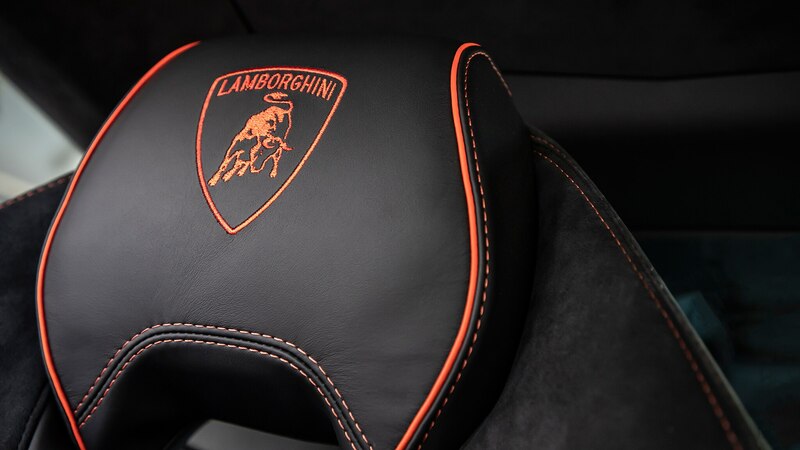 But Lamborghini’s latest bolsters the brand’s footing as a purveyor of supercars that are both reassuringly raw and increasingly smart.